Arrestins (abbreviated Arr) are a small family of proteins important for regulating signal transduction at G protein-coupled receptors. 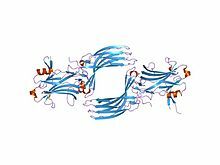 Arrestins were first discovered as a part of a conserved two-step mechanism for regulating the activity of G protein-coupled receptors (GPCRs) in the visual rhodopsin system by Hermann Kühn, Scott Hall, and Ursula Wilden and in the β-adrenergic system by Martin J. Lohse and co-workers. In response to a stimulus, GPCRs activate heterotrimeric G proteins. In order to turn off this response, or adapt to a persistent stimulus, active receptors need to be desensitized. The first step in desensitization is phosphorylation by a class of serine/threonine kinases called G protein coupled receptor kinases (GRKs). GRK phosphorylation specifically prepares the activated receptor for arrestin binding. Arrestin binding to the receptor blocks further G protein-mediated signaling and targets receptors for internalization, and redirects signaling to alternative G protein-independent pathways, such as β-arrestin signaling. In addition to GPCRs, arrestins bind to other classes of cell surface receptors and a variety of other signaling proteins. Arrestins block GPCR coupling to G proteins in two ways. First, arrestin binding to the cytoplasmic face of the receptor occludes the binding site for heterotrimeric G-protein, preventing its activation (desensitization). Second, arrestin links the receptor to elements of the internalization machinery, clathrin and clathrin adaptor AP2, which promotes receptor internalization via coated pits and subsequent transport to internal compartments, called endosomes. Subsequently, the receptor could be either directed to degradation compartments (lysosomes) or recycled back to the plasma membrane where it can again signal. The strength of arrestin-receptor interaction plays a role in this choice: tighter complexes tend to increase the probability of receptor degradation (Class B), whereas more transient complexes favor recycling (Class A), although this “rule” is far from absolute. ^ a b PDB: 1CF1​; Hirsch JA, Schubert C, Gurevich VV, Sigler PB (April 1999). "The 2.8 A crystal structure of visual arrestin: a model for arrestin's regulation". Cell. 97 (2): 257–69. doi:10.1016/S0092-8674(00)80735-7. PMID 10219246. ^ a b Moore CA, Milano SK, Benovic JL (2007). "Regulation of receptor trafficking by GRKs and arrestins". Annual Review of Physiology. 69: 451–82. doi:10.1146/annurev.physiol.69.022405.154712. PMID 17037978. ^ Lefkowitz RJ, Shenoy SK (April 2005). "Transduction of receptor signals by beta-arrestins". Science. 308 (5721): 512–7. doi:10.1126/science.1109237. PMID 15845844. ^ Wilden U, Hall SW, Kühn H (March 1986). "Phosphodiesterase activation by photoexcited rhodopsin is quenched when rhodopsin is phosphorylated and binds the intrinsic 48-kDa protein of rod outer segments". Proceedings of the National Academy of Sciences of the United States of America. 83 (5): 1174–8. doi:10.1073/pnas.83.5.1174. PMC 323037  . PMID 3006038. ^ a b Gurevich VV, Gurevich EV (June 2006). "The structural basis of arrestin-mediated regulation of G-protein-coupled receptors". Pharmacology & Therapeutics. 110 (3): 465–502. doi:10.1016/j.pharmthera.2005.09.008. PMC 2562282  . PMID 16460808. ^ Smith JS, Lefkowitz RJ, Rajagopal S (January 2018). "Biased signalling: from simple switches to allosteric microprocessors". Nature Reviews. Drug Discovery. doi:10.1038/nrd.2017.229. PMID 29302067. ^ Cahill TJ, Thomsen AR, Tarrasch JT, Plouffe B, Nguyen AH, Yang F, et al. (February 2017). "Distinct conformations of GPCR-β-arrestin complexes mediate desensitization, signaling, and endocytosis". Proceedings of the National Academy of Sciences of the United States of America. doi:10.1073/pnas.1701529114. PMC 5347553  . PMID 28223524. ^ Kumari P, Srivastava A, Banerjee R, Ghosh E, Gupta P, Ranjan R, Chen X, Gupta B, Gupta C, Jaiman D, Shukla AK (November 2016). "Functional competence of a partially engaged GPCR-β-arrestin complex". Nature Communications. 7: 13416. doi:10.1038/ncomms13416. PMC 5105198  . PMID 27827372. ^ Kumari P, Srivastava A, Ghosh E, Ranjan R, Dogra S, Yadav PN, Shukla AK (April 2017). "Core engagement with β-arrestin is dispensable for agonist-induced vasopressin receptor endocytosis and ERK activation". Molecular Biology of the Cell. 28 (8): 1003–10. doi:10.1091/mbc.E16-12-0818. PMC 5391177  . PMID 28228552. ^ Gurevich VV, Gurevich EV (February 2004). "The molecular acrobatics of arrestin activation". Trends in Pharmacological Sciences. 25 (2): 105–11. doi:10.1016/j.tips.2003.12.008. PMID 15102497. ^ Gurevich EV, Gurevich VV (2006). "Arrestins: ubiquitous regulators of cellular signaling pathways". Genome Biology. 7 (9): 236. doi:10.1186/gb-2006-7-9-236. PMC 1794542  . PMID 17020596. ^ Kang Y, Zhou XE, Gao X, He Y, Liu W, Ishchenko A, et al. (July 2015). "Crystal structure of rhodopsin bound to arrestin by femtosecond X-ray laser". Nature. 523 (7562): 561–7. doi:10.1038/nature14656. PMC 4521999  . PMID 26200343. ^ Han M, Gurevich VV, Vishnivetskiy SA, Sigler PB, Schubert C (September 2001). "Crystal structure of beta-arrestin at 1.9 A: possible mechanism of receptor binding and membrane Translocation". Structure. 9 (9): 869–80. doi:10.1016/S0969-2126(01)00644-X. PMID 11566136. Ig-like beta-sandwich fold. Scop reports duplication with C-terminal domain. G protein-coupled receptors are a large family of signalling molecules that respond to a wide variety of extracellular stimuli. The receptors relay the information encoded by the ligand through the activation of heterotrimeric G proteins and intracellular effector molecules. To ensure the appropriate regulation of the signalling cascade, it is vital to properly inactivate the receptor. This inactivation is achieved, in part, by the binding of a soluble protein, arrestin, which uncouples the receptor from the downstream G protein after the receptors are phosphorylated by G protein-coupled receptor kinases. In addition to the inactivation of G protein-coupled receptors, arrestins have also been implicated in the endocytosis of receptors and cross talk with other signalling pathways. Arrestin (retinal S-antigen) is a major protein of the retinal rod outer segments. It interacts with photo-activated phosphorylated rhodopsin, inhibiting or 'arresting' its ability to interact with transducin [PUBMED:15335861]. The protein binds calcium, and shows similarity in its C terminus to alpha-transducin and other purine nucleotide-binding proteins. In mammals, arrestin is associated with autoimmune uveitis. Arrestins comprise a family of closely-related proteins that includes beta-arrestin-1 and -2, which regulate the function of beta-adrenergic receptors by binding to their phosphorylated forms, impairing their capacity to activate G(S) proteins; Cone photoreceptors C-arrestin (arrestin-X) [PUBMED:7720881], which could bind to phosphorylated red/green opsins; and Drosophila phosrestins I and II, which undergo light-induced phosphorylation, and probably play a role in photoreceptor transduction [PUBMED:8452755, PUBMED:1517224, PUBMED:2158671]. 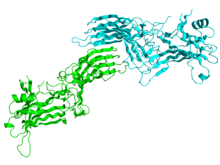 The crystal structure of bovine retinal arrestin comprises two domains of antiparallel beta-sheets connected through a hinge region and one short alpha-helix on the back of the amino-terminal fold [PUBMED:9495348]. The binding region for phosphorylated light-activated rhodopsin is located at the N-terminal domain, as indicated by the docking of the photoreceptor to the three-dimensional structure of arrestin. The N-terminal domain consists of an immunoglobulin-like beta-sandwich structure and is found in arrestin and related proteins. For example, thioredoxin-interacting protein (TXNIP) matches the arrestin N domain [PUBMED:18664266, PUBMED:23519408]. 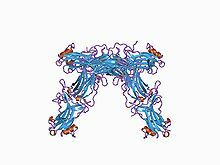 For those sequences which have a structure in the Protein DataBank, we use the mapping between UniProt, PDB and Pfam coordinate systems from the PDBe group, to allow us to map Pfam domains onto UniProt sequences and three-dimensional protein structures. The table below shows the structures on which the Arrestin_N domain has been found. There are 63 instances of this domain found in the PDB. Note that there may be multiple copies of the domain in a single PDB structure, since many structures contain multiple copies of the same protein sequence.